On the South African airways flight from Frankfurt to Johannesburg, all stewards were black and the captain was called ‘Commander’. The stewards seemed to be enjoying themselves, laughing as they passed a juice can across, or chatting merrily in the steward area, and their English accent carried no hint of the American drawl or British elocution: listening to them was a pleasure. I want to hear that again. At Johannesburg, following my wife’s advice, I did not stray far from the hotel during the three days the conference was on. When I left the city, on a Friday morning Kulula airlines flight to Cape Town, the only authentic Jo’burg experience I could claim was a petty crime. Perhaps ‘crime’ is too harsh; ‘swindle’ is better: swindled by a smart black waiter at a pizzeria. The bill had come to fifty three rand. Keeping in mind a seven rand tip, I dropped seventy rand in notes — a fifty and a twenty — on the table. The waiter, a thin young man with a brisk manner, collected the notes with a wide grin, said “Thank you, Sir”, and disappeared inside. I sensed what had happened, but refused to believe it. Ten minutes later when I saw him idling in a corner, it was time to get up and leave. The woman beside me on the flight — white, in her late forties — was traveling with her husband to Cape Town for the weekend. She lived in Pretoria, commuted daily to Jo’burg, worked in the Pharma industry. Weekend getaways to Cape Town were ideal, she said. She could not imagine living there — the city’s pace was too relaxed (Slaapstad, she said it was, Sleepy Town not Kaapstad, Cape Town). When she learned this was my first visit to South Africa, she grew animated and began to list places I must visit in Cape Town, pointing on my map also areas to avoid (black-only neighbourhoods), offering tips on how to stay safe: don’t walk with your camera in the open, don’t talk to strangers, avoid deserted streets — reasonable advice, none of which I had the necessity to follow. We talked cricket, the Hansie Cronje scandal and what money had done to the game, the ongoing world cup (“When you are in South Africa, support our team!”). She bought me a drink, tapped my arm when she pointed at something on the map, and tried, unsuccessfully, to draw her husband into the conversation. With him she spoke Afrikaans, but when I asked if she had Dutch ancestry she said she wasn’t sure. She had never visited Europe. “Maybe I will, someday,” she said. The hotel in Cape Town shared a restaurant with the local university’s Graduate School of Business, and at lunch on the first day I saw students sitting together in mixed groups, black and white and coloured. (Cape Town is 16% black, 32% white and 45% coloured. Cape Coloured are a group with mixed ancestry, including European and the indigenous Xhosa and Khoisan, among others.) At one table were four black women and two white men, in their late twenties, the men sitting on opposite sides between the chatty women who kicked up a roar every some minutes, laughing at the men with a deep bellow that must be, I decided, an African trait. It lightened my mood. The lunch buffet was a meat-lover’s delight, so I ordered a vegetarian pizza. “Without mushrooms please,” I added. The waitress, a ponytailed black girl who had just come of driver’s license age, giggled at my order. “You are vegetarian?” she asked. It tickled her, and she did not hide her amusement. Had my wife been with me, she would have laughed with the girl. The waterfront was too touristy for my liking, so I took a myCiti bus — the local public transport — to the city centre. On the bus I was the only tourist (at least, the only passenger with a camera in the open), and among the locals were half a dozen black women sitting at the front, on both sides of the wide aisle. They were traveling individually, but at one point two of them got talking and soon the chatter — a mixture of English and a native tongue whose sounds resembled nothing I had heard before — spread to the other women, growing louder by the minute. Near the journey’s end they were all of one party, a boisterous bunch out for a picnic somewhere. At the Civic Centre, as they left the bus, one of them spoke loudly in a sing-song voice: Goodbye Mistah driver! From Civic Centre, crossing the large railway station building, I walked towards Greenmarket square, home to an open market for antiques and handicrafts. But I was late. The market was closed, the stalls were being dismantled. In a cafe next to the square an Indian-looking waitress explained that they began early in the day and closed early. Muscular black young men were gathering poles of rusted-iron, slotted angle shelves, and wooden boards onto trolleys and wheeling them, with difficulty, across the square. It was past 6 pm. 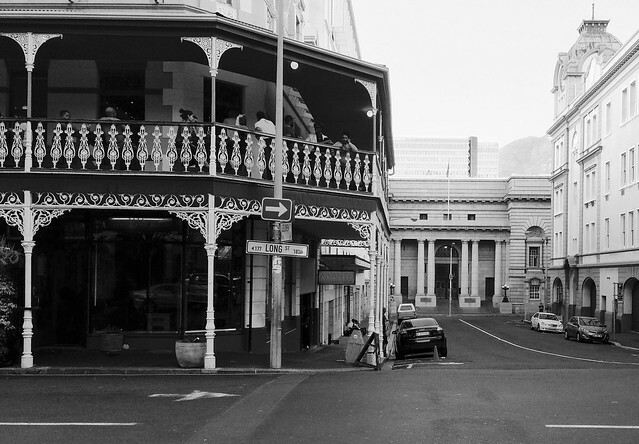 The old Town House that stood overlooking the square and held some paintings of seventeenth-century Dutch masters — Ruisdael, Frans Hals — was also closed, so I headed up Shortmarket Street towards Bo-Kaap. At a traffic intersection I found myself standing beside a girl, coloured, aged ten or so, who asked me for money. It was odd to hear a beggar speak so eloquently in English. Was she an actor in costume, rehearsing her lines on the stage of life? I looked away, hiding a smile that had begun to turn into laughter. The light switched to green and, on instinct, I walked across. She did not follow me. I still regret not giving her money. I continued uphill, towards Bo-Kaap. The afternoon had been uninspiring this far — the waterfront was a disappointment, and the city centre was winding down already on a Friday evening. Was all the beauty in Cape Town confined to the beaches? Bo-Kaap — ‘Upper Cape’ in Afrikaans — took away my doubts. Set on the slopes of Signal Hill, this warren of quiet streets is a world away from the bustle of traffic below. The community living here traces its origins to slaves imported by the Dutch in the seventeenth century from Madagascar, Indonesia and Malaysia (hence the alternate moniker, Malay Quarter). Walking among those low roofed, colourful houses, I recalled a walk through the old part of town in Panjim (Goa) a few years ago. What the two localities shared was a cultural homogeneity largely uncorrupted by external influences. In Bo-Kaap it was the architecture — semi-detached houses with flat roofs, front porches, Cape Dutch styled doors and windows — and the colours that created this feeling, but the atmosphere was accentuated by its unlikely residents. Bearded elderly men in kurtas and skullcaps were out on an evening stroll, and at one corner five or six similarly dressed men emerged from a mosque. It could have been a street in Cairo. Up ahead, watching me approach, a bunch of children on the footpath turned to me and danced, jiggled, and waved — I waved back, resisting an urge to jiggle. 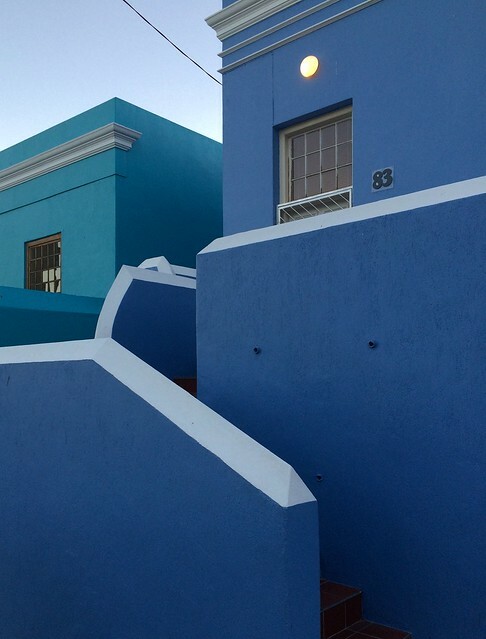 Those striking colours, Bo-Kaap’s signature, are a recent development, a style that emerged after the end of apartheid. Until 1992 it was an excluded quarter, segregated along racial lines, and in a way it has retained that character — of separateness if not isolation — which these days is celebrated. The Bo-Kaap museum was closed, and I spent a restful hour walking through the lanes, taking photographs, framing the straight lines the colours revealed. 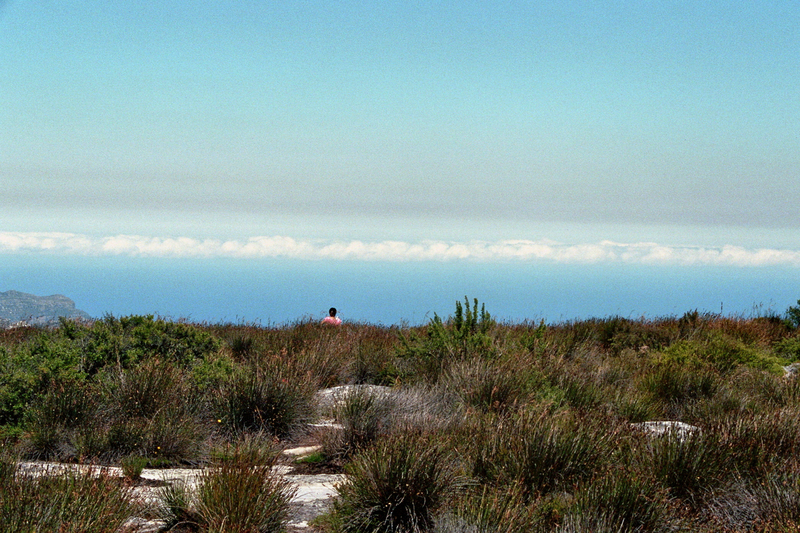 The Table Mountain is Cape Town’s Eiffel, which is reason enough to skip it when you have only a weekend in the city. I didn’t, and I came to regret my decision. From a distance the mountain is beautiful. It’s oddly flat summit is often hidden behind clouds that hug the mountain (or, going by Kaapstad cliche, cover it like a tablecloth). The clouds seem to flow over the mountain top and gently dissolve into air: a magician’s act in plain sight. In different corners of Cape Town this image paints an eye-stopping backdrop to the cityscape, but the tourists want more. They take a cable car up the mountain and walk across its flat rocky surface. The cable car ride, in a car with a rotating floor that presents a 360 degree view as you ascend the thousand meters, was enjoyable and short. There was a long queue to get on it, and on top, outside the station in the rarified air, the atmosphere was of a flea market. It was hard to click a photograph without white skin in the frame, and impossible to find moments free of tourist chatter. 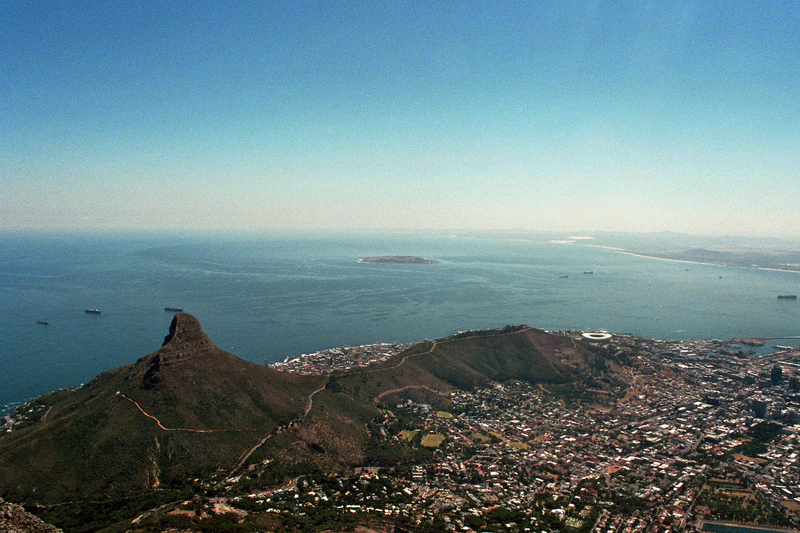 The official language of the Table Mountain is German. The Dutch came here first, about three centuries earlier, but now the Germans are on top. I heard more German in an hour up there than I do in a month in Heidelberg. On the bus back to the city centre I traveled with an elderly German couple. They had moved to the US several decades ago and had grown-up children living there; Germany was now a distant memory. We exchanged impressions of cities in the north, Hamburg, Hannover, Luebeck, places they once considered home. They had married in Hamburg, he had bought his first car — a Volkswagen — in Hannover. I wondered if I spoke in a similar manner about India, recalling frozen impressions of cities and events in the eighties and nineties. The city isn’t suited for walking the way many European cities are. I spent a lot of time waiting for myCiti buses to get from one neighbourhood to another. The buses ply with lesser frequency during weekends, which perhaps suits the city’s pace, and it took me a while to relearn the art of waiting. On one such ride, from the city centre to the waterfront, I met G. He was sitting across the aisle talking in English to another black youngster, exchanging notes on studying abroad. G had been accepted by a UK university but did not manage to secure a scholarship. Even applying to those universities abroad, he said, was an expensive affair — there was a limited number you could afford to aim for. Something about G intrigued me. The bus ended its journey at the waterfront, and I caught up with him as he left the station. Once a German colony, Namibia today is home to thirty thousand Germans. The country has a German radio station and a daily newspaper. What had piqued my interest was the ambition in this young black man, the desire to leave Africa and go West, the dreams of making it big. This had emerged quickly in the conversation I had overheard, and it did so in his chat with me. We walked into the Victoria Wharf shopping centre, doing small talk, and at one point I stopped outside a bookstore and said I wanted to browse some titles. “Me too,” he said, and followed me in. He wasn’t keen on books, but he tried to look interested, asking me questions on the subjects I liked. There was a coffee bar attached to the store, and I suggested we have a drink together. G wore a red T-shirt over black jeans. Short and lean, he had the edgy manner of a hyperactive person, eyes darting here and there, unable to keep eye contact for long. Only in his third month in Cape Town, he lived with his aunt and her two sons, both around his age. He asked about Germany, and went on to describe the Germans in Namibia, pausing now and then, as though unsure how much to reveal. They were nice, he said, but stiff and not really warm. He impersonated their manner as he spoke, sitting upright with his head tilted back, then laughed. In Namibia his father had always sent him to schools with white teachers (they were the better ones). He liked Bollywood movies — 3 Idiots was one of his favourites. Recalling the movie, he laughed again. G’s keenness to study abroad was evident. He wanted to apply before he finished his engineering, receiving only a diploma in Cape Town after two years and completing his engineering in the UK. Or Germany, I suggested, since he spoke the language. He concurred, and added that his German was still elementary but he would now try to improve it. In the half hour we were together, although G often brought up the subject of going abroad, he did not complain about South Africa or Namibia. He was curious, sharp, funny, and there was a positive energy about him that I found compelling. We exchanged email addresses, and he promised to keep in touch. The Company’s garden, not far from Greenmarket square, had started as a vegetable garden set up by the Dutch East India Company in the mid-seventeenth century to produce fruits and vegetables for their ships stopping at the Cape of Good Hope, on their way to or returning from Asia. What began as a garden grew into a settlement (supported in large part by slaves) and, when the British took over in the early nineteenth century, they called it Cape Town. In the nineteenth and twentieth century, several important buildings including the Houses of Parliament and the South African National Gallery were built around the garden. These elegant, whitewashed buildings give the area a colonial feel; the scene and the atmosphere has probably not changed in a hundred years. It was a clear, balmy morning. 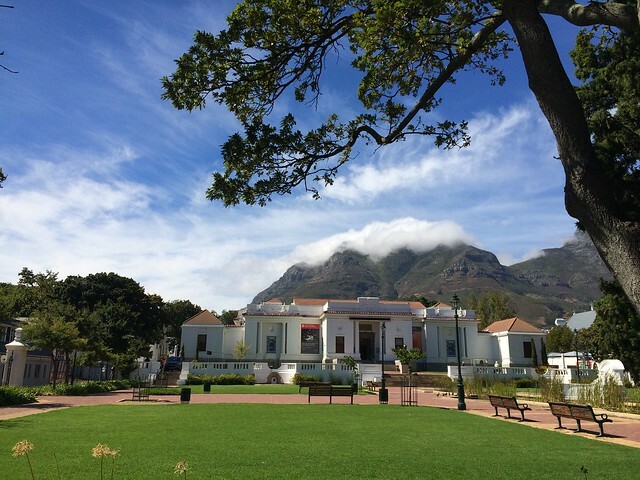 Ahead of me was the impressive National Gallery, set in the foreground of the stunning Table Mountain. The lawn in front was bordered by plants that were being tended to by three black men. At that moment, standing near the National Gallery, I saw why the whites had stayed behind in South Africa. This place was beautiful, the weather was mild, and the labour cheap. These days, white South Africans who leave the country cite crime as the most common reason for emigrating, and their preferred destination is Australia, a country with similar physical and economic environment and far less crime. After visiting the gallery, back at the entrance, I sat on the steps and began to consider the less pleasant side of this society. The Table Mountain, I recalled, was largely white; the myCiti buses mostly black or coloured; in restaurants the waiters were coloured or black, the patrons predominantly white; the shipyard workers were black or coloured, the street performers were black, the street-side vendors were black, the taxi-drivers were black or coloured, the Audis and BMWs were peopled by whites; around me in the National Gallery were white people, the artists featured were white, and the only museum guard I saw was black. The numbers matched this surface perception. A 2014 Oxfam report on inequality summed it up grimly: “In South Africa, inequality is greater today than at the end of apartheid.” Such a gap is not unique to this country, but since it closely follows the racial line the inequality here is easier to spot, and it gets framed as a problem of race: the whites are rich, the blacks and coloured are poor. Some restaurants, cafes, and shops displayed a sign that said: Rights of admission reserved. A reminder of a similar display that once kept out people of colour, it seemed to confer upon establishment owners the right not to let someone in for an arbitrary reason. Given the country’s history, the sign’s existence was puzzling. I tried to imagine a sign in Berlin that suggested, without explicitly saying so, that Jews may not be allowed into a restaurant or a cafe. A national scandal would follow. But alongside these signs were others that struck a different note. Black and coloured people mixed with whites as though this was most natural. In a myCiti bus a white woman playfully pinched the cheeks of a black baby strapped to the mother’s back. A group of white, black, and coloured school-children bearing guitars, saxophones, flutes, and kettle-drums walked with their teacher to a music competition at the waterfront. Trendy young men and women of different colours sat and laughed together in outdoor cafes along Long Street. To note these trivial occurrences may seem absurd until one remembers that such connections were illegal, if not impossible, before 1992. On a bright Sunday morning the Greenmarket square is ideal for a lazy walk around the freshly setup stalls full of paintings, wooden figurines and masks, junk metal radios and coke-can contraptions, drums, flutes, catapults, bed-covers, necklaces, bracelets: plenty to interest a memento seeker. 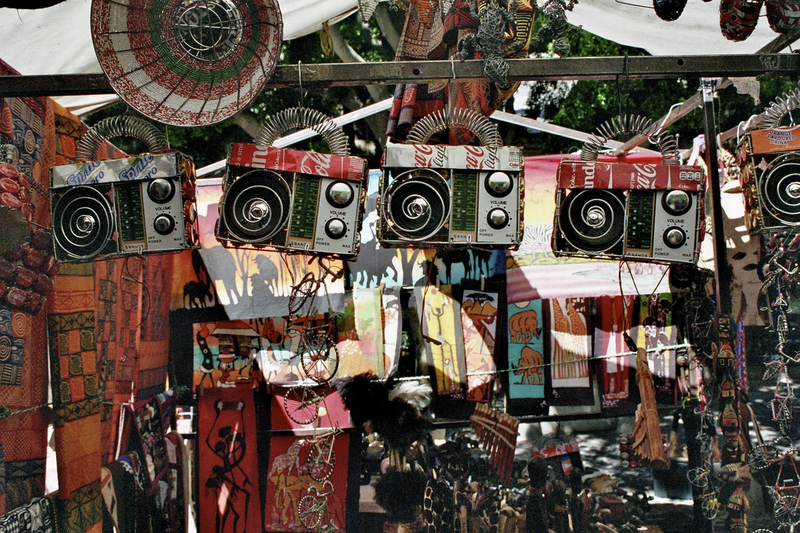 The vendors look relaxed, in the mood for a chat. The first one I spoke to said his name was Cosmos. His smile was wide as the Milky Way. He was from Zambia, and I was his first customer. He repeated this a few times during our chat. Cosmos had a warm, easy-going nature. He looked young, in his thirties, but spoke with the calm assurance of someone much older. When he learned that I lived in Germany, he showed off a few words : Guten Tag, Zehr Schön. I bought from him a small Africa-shaped “ebony” wall-hanging inlaid with etchings of an elephant, a rhino, and a giraffe. Akida, in a stall nearby with paintings and sketches bearing his signature, wore a Hurley T-shirt and sported dreadlocks. I liked a painting of zulu herdsmen with their cattle, and over this piece of canvas we haggled, gently going back and forth, Akida nudging me towards the figure in his mind (“Make that a little higher, my friend, just a little higher.”), me pretending to fret over the price while praising his skills as an artist. He was from Malawi, and had moved to Cape Town six years before. (Greenmarket square, I discovered, was more black than coloured, more Africa than South Africa.) Competition was on the rise, as people set up such stalls in nearby streets, diverting tourists away from the square. We agreed to a price of four hundred rand, half the amount he had quoted first. I left Cape Town the next morning, carrying these two artefacts and plenty of impressions I still had to sort out. Many had promised a beautiful city. They probably meant the beaches (which I did not visit) or the Table Mountain (which I did enjoy, from a distance). The beauty I found was elsewhere: among the people I met and watched and listened to; in the complicated mix of history, race, affluence, and poverty; in the confidence I saw among the black and coloured people. The weekend had given me only a glimpse of the city, there were vast areas still to explore, but at this point I was excited more by what was to follow in the next five days: a road-trip through small towns, desolate landscapes, unfamiliar cultures. A story for another day. Good stuff! You’ve been away from blogging quite a long time? I was distracted for a while by fiction, Fëanor. And you’ve been away from commenting here quite a long time? (The last — and your only — comment was in 2010). What a pleasant surprise! You made the people you met come to life for me. I feel like I was there with you, listening to the melody of African voices. Thanks! If you did feel that way, you are the person this piece was written for! Its good to read you again M. Hope you are well. You’ve returned to your blog too, S, which is very nice.